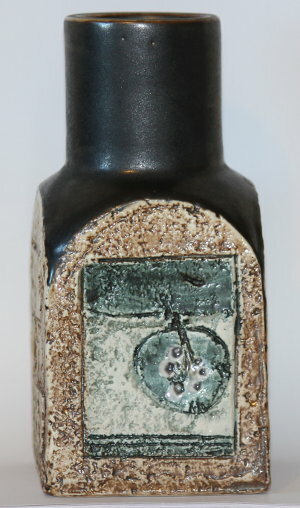 We have added a lovely and unusual Troika Spice vase to our Troika Pottery For Sale page. This textured Troika vase has an unusual abstract apple design on one side! This genuine Troika vase was decorated by Alison Brigden and dates c1977-1983. It has a textured body and smooth glazed chimney top. A lovely practical piece of Troika Pottery with an eye-catching design. We only sell genuine Troika Pottery and have a wide range of Troika to buy including many textured Troika Pottery vases and larger pieces such as Troika Pottery lampbases – perfect for any living room! Click here to see our full selection of Troika for sale. If you see a piece of Troika you like or think would make a great Christmas gift, don’t leave your Christmas shopping too late and let someone else beat you to that special piece! This entry was posted in New Stock and tagged Alison Brigden, Christmas Shopping, Troika Pottery on October 22, 2014 by Perfect Pieces. We have just added a lovely large Troika wheel lamp base to the Troika Pottery For Sale page. This is a lovely textured piece of Troika Pottery that not only is a collectable item but is an attractive and practical lamp for everyday use in your home. This is an impressive large piece of Troika Pottery decorated by Penny Black and featuring circular motif designs on both sides. CLICK HERE – To view more details and photographs of this Troika lamp base for sale. We always stock a wide range of Troika for sale and our stock changes regularly so be sure to check back if you’re after something specific, or just get in touch. This entry was posted in Troika and tagged Penny Black, Troika lamp base, Troika Pottery on May 27, 2014 by Perfect Pieces. Looking To Buy Some Troika Pottery? Are you thinking of buying some Troika? This eye-catching pottery has become a firm favourite with collectors in recent years, and you’ve probably seen it on TV or handled it at an antique fair or antique centre. The most popular type of Troika is its textured ware, which combines a textured finish with colourful, moulded designs. When it was new, it was considered to be very modern and unlike many antiques and collectables, Troika fits in really well with the style and design of modern homes, thanks to its abstract designs, bold colours and simple yet creative shapes. We have a wide range of Troika for sale ranging from the smaller textured Troika Marmalade vases and Troika Cube vases to larger pieces such as the textured Troika Rectangular vases, which make really stylish display pieces. A lesser-known type of Troika is the pottery’s smooth-glazed ware. This was one of the pottery’s early ranges and was made in quite low volumes, making it rarer today. It’s completely different in style to the textured ware, although it does use some of the same shapes. Most pieces are based on a white glaze with green, blue or black decoration, as I’ve shown in the pictures below. Some unusual items are glazed completely in black, too! Pictured below are two lovely pieces we currently have for sale – an eye catching glazed Troika St Ives cube vase and a lovely glazed Troika St Ives egg cup. So, if you’re thinking about starting a Troika collection and buying Troika Pottery then do check out the current selection of Troika Pottery we have for sale. This entry was posted in Troika and tagged Buy Troika, Buy Troika pottery, Cornwall, Troika, Troika Cube, Troika egg cup, Troika Pottery, Troika St Ives, Troika vase on June 13, 2013 by Perfect Pieces. Decorated by Alison Brigden this genuine Troika Pottery vase dates c1977-1983. With a blue glazed chimney top the textured body of this vase has been decorated with grey greens with the abstract design picked out in contrasting shades of browns. Click here to see more photographs and details of this Troika vase. We have a wide range of Troika Pottery for sale including some early Troika St Ives pieces. All of our Troika Pottery is genuine Troika made by the original pottery based in Cornwall, England, and dating between 1963-1983. This entry was posted in New Stock and tagged Alison Brigden, Studio Pottery, Troika, Troika for sale, Troika Pottery, Troika Spice vase, Troika St Ives on June 6, 2013 by Perfect Pieces. This is a really lovely Troika Chimney vase decorated with a textured front and back and lovely white glazed sides and chimney top. This genuine Troika vase dates from c1977-1983 and was made when the pottery was based in Newlyn, in Cornwall, England. Click here to view more photos and information on this stunning Troika vase. In our Troika Pottery section you’ll find a wide range of Troika vases for sale ranging from smaller Troika marmalade vases to larger early Troika St Ives rectangular vases. CLICK HERE – To view our full selection of Troika Pottery for sale. This entry was posted in New Stock and tagged Alison Brigden, Troika Chimney, Troika Pottery, Troika St Ives, Troika vase on June 3, 2013 by Perfect Pieces. Troika Pottery Marmalade Vases – For Sale! This is a genuine Troika vase – as are ALL of our Troika Pottery pieces. It has a striking abstract decoration on all sides, and can be dated to c1973-1979. Click here to view more photos and details of this pretty Troika vase. 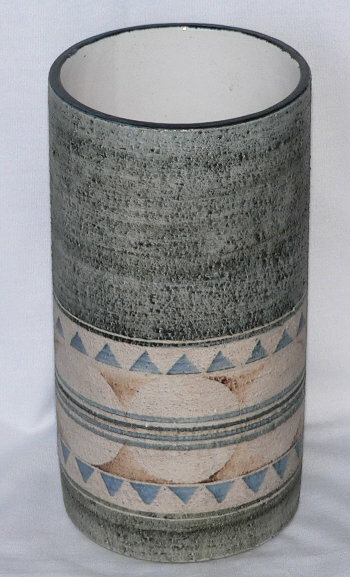 We have another Troika Pottery Marmalade vase for sale, this one decorated by Teo Bernatowitz. Teo Bernatowitz only worked at the Troika Pottery around c1974 when it was based in Newlyn, Cornwall, England. Click here to see more photos of this lovely Troika vase. We have a wide range of Troika Pottery for sale including some early Troika St Ives vases, some textured Troika vases and some Troika smooth glazed wares. This entry was posted in New Stock and tagged Avril Bennet, Cornwall, Studio Pottery, Teo Bernatowitz, Troika for sale, Troika Marmalade Vase, Troika Pottery, Troika vase on May 30, 2013 by Perfect Pieces. This is a genuine Troika Vase, as are all of our Troika Pottery pieces we have for sale. It has a textured body and a smooth glazed chimney top, and has been decorated by Louise Jinks. It can be dated to c1976-1981 when the pottery was based in Newlyn, in Cornwall, England. It has very appealing decorations on all sides – on one side it has the popular T design. Click here to view more pictures of this lovely Troika vase. We have a wide range of Troika for sale including early Troika St Ives pieces and some lovely larger pieces such as Troika Chimney vases and Troika Rectangular vases. This entry was posted in New Stock and tagged Cornwall, Louise Jinks, Studio Pottery, Troika, Troika for sale, Troika Pottery, Troika Spice, Troika vase on May 29, 2013 by Perfect Pieces. Genuine Troika Pottery For Sale – Perfect For Christmas! If you’re still trying to find that perfect Christmas present then why not consider a piece of Troika Pottery? We have a wide selection of Troika for sale and all our Troika pieces are guaranteed genuine Troika pottery made by the Troika Pottery between c1963 until it closed in c1983. Prices of the Troika Pottery we currently have for sale range from just over £80 right up to over £200, so we do have something to suit every budget! Troika St Ives cube vase, textured Troika Marmalade vase, large Troika shouldered Cylinder vase & a stunning Troika Chimney vase. Remember, each item we sell is unique and we cannot order more to meet demand! If you’ve got your eye on something specific, then don’t leave it too late to order, or you may be disappointed! This entry was posted in Gift Ideas and tagged Christmas presents, Studio Pottery, Troika Chimney, Troika Cylinder, Troika for sale, Troika Marmalade, Troika Pottery, Troika St Ives, Troika vase on December 7, 2012 by Perfect Pieces.